If you’re looking for the perfect dining experience in Copenhagen – and I emphasise the word experience – The Red Box is an unforgettable evening out. Tucked away down a street off Kongens Nytorv and within easy walking distance of iconic Nyhavn, the restaurant is perfectly placed in the city centre. Established five years ago, The Red Box has made a name for itself due in large part to the creativity and passion of head chef and owner Allan Huynh. 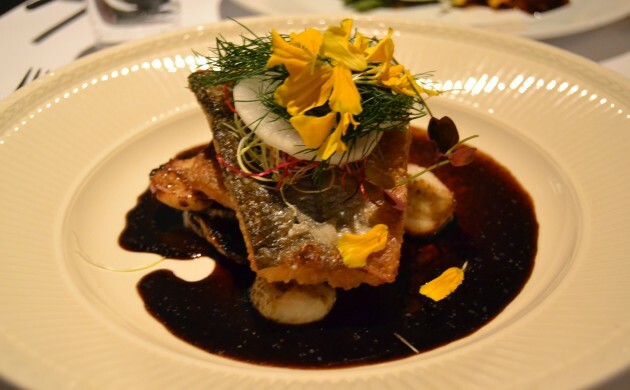 His meticulous attention to detail is on display in each dish of his Chinese-French fusion cuisine. The restaurant, with seating space for 30, is intimate and cosy and the decor gives the restaurant its name. Traditional Scandinavian design is lent a twist with red accents in the form of lighting, artwork and accessories. Chinese bamboo, fish tanks and the wine bottles on display complete the look and make for a rather slick first impression. The Red Box experience starts from the moment you walk through the door. 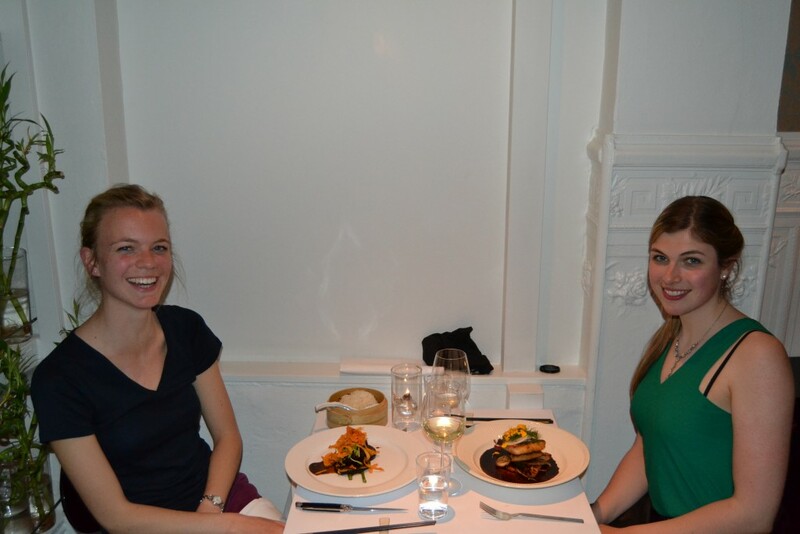 Our coats were checked, we were seated and the waiter welcomed us with hot, mint-scented towels, the menu and wine list. The small team at The Red Box is friendly and knowledgeable and will happily take their time to go through the menu if you wish so. A two-course menu is offered, where you choose one of four starters and one of four main courses, while the three-course menu adds dessert. A third option for the more curious amongst you is the popular tasting menu ‘15’, which comprises 15 delicacies served over five courses. My friend and I decided on the three-course menu. Tobias, our waiter, recommended the crisp and fruity Californian Lucky Star chardonnay to accompany our seafood starters. A small surprise was served up prior to our starters in the form of two amuse-bouches. The first was a shrimp salad with grapefruit, kiwi, coconut and pomegranate that lit up my tastebuds. The second was a tasty Filo parcel with vegetables and seaweed. The starters were beautifully presented. The perfect one for those who like variety is the ‘Five from China’, an option with five small seafood delicacies: a fried calamari with tomato salad, a slice of shrimp toast with parsley and sesame, a tiger prawn in tamarind sauce, a piece of cod with mango and black bean sauce, and last, but definitely not least, a fried scallop topped with a shrimp in a lemon, orange and ginger sauce. It tasted as good as it sounds and it’s hard to pick a favourite. If pressed I’d have to say the scallop was the highlight, as it was both succulent and flavoursome. My friend had the tiger prawns in tamarind sauce to start. The dish, served on sliced cucumber and garlic sprouts, was exquisitely decorated with pomegranate and edible flowers. For those less partial to seafood, The Red Box offers starters such as the French onion soup (albeit with a scallop papilotte) or the Trois couches, a three-layered serving of avocado and cucumber, tomato and parsley and chicken – a treat for both the eye and palate. After our starters, expectations were high for the main courses. Our choices were the fish of the day and the beef tenderloin in a spicy black pepper sauce. They were presented with as much attention to detail as the starters, and the dishes themselves did not disappoint. The catch of the day was hake served in a sweet basil-vinegar sauce accompanied by water chestnuts, sliced potatoes and sautéed lotus roots. The fish, prepared to perfection, was the best I have tasted in a long time, with the sauce providing the perfect complement. 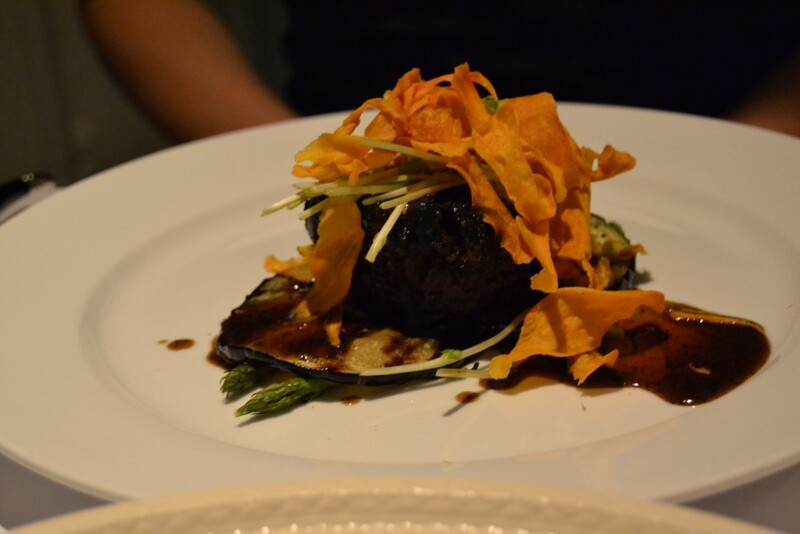 Meat lovers will adore the beef tenderloin, a juicy cut in spicy black pepper sauce, served on grilled eggplant and green asparagus and topped with parsnip chips. Rice was served on the side. Be aware that the sauce is very spicy and that the cautious amongst you might prefer it on the side. Consider a glass of the Fat Monk Pinot Noir to pair with the beef. I was satisfied and rather full by the time dessert arrived, but had no regrets in finishing every last spoonful! Dessert was a selection of four carefully crafted offerings. I began with the rhubarb tart with white chocolate and pistachio nuts, moved on to the dark chocolate cake with raspberry, then sampled a wonderful ginger crème brûlée before finally trying the delicate Earl Grey tea ice cream, Huynh’s signature dessert. The latter is unique and perhaps worth a trip to The Red Box all by itself! I thoroughly recommend experiencing this culinary adventure and the opportunity to enjoy French-Chinese fusion at its best. Ensure you have ample time to enjoy the evening, especially if you want to try ‘15’. The friendly staff (who in total speak more than seven languages) and the warm and welcoming chef add to the restaurant’s charm. Just don’t try and tease the secret recipes out of the staff, it’s a fruitless task – believe me, I’ve tried! 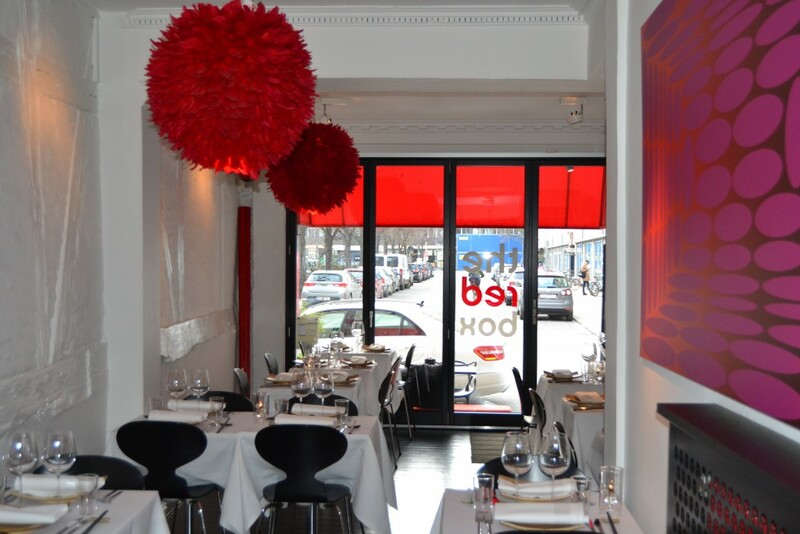 The Red Box is the perfect location for a date night, business dinner or party and will no doubt leave you wanting more.